Guess what time it is?! Yeah, it’s time for the Hodgepodge! You’ll see the theme of time in this week’s questions. Answer on your own blog and link up with Joyce. I have mixed feelings about this app. The lengths people are going through to collect the characters is ridiculous. People are throwing caution and respectability to the wind because of a virtual game. Really? On the plus side, it is getting people moving. I use the app Charity Miles, which partners up with different sponsors who donate money for how far people move their bodies (inside, outside, and biking). This app had record-breaking numbers a few days ago because of Pokemon Go, and charities benefited. For fun, have you seen this video…Chardonnay Go? Oh my. It’s totally more my speed!! By the way, when I was on the hunt for this video, I googled “Chardonnay Run” by mistake and discovered that there is a Chardonnay Run in San Diego! It’s a 5k, and you get to do wine tasting after! Sign me up!! 2. What was something you collected as a child? Do you still have that collection? If you’re a parent what’s something your own children collected? Have you ever camped out, stood in a crazy long queue, or paid a ridiculous sum for a ‘collectible’? I cannot think of anything I collected when I was a child. I don’t have many things left from my childhood other than a few books. My children collected a few things. Chicky collected key chains and American Girl dolls. Rooster collected Hot Wheels cars and baseball cards. Both children had large collections of books. Reading was a big thing in this house. Have I ever stood in a long queue to get a collectible? Not that I recall. I never really bought in (pun intended) to fads such as Bratz dolls (remember those) or Pokemon cards. We didn’t have the money, and I wanted my kids to be their own people. My summer has been especially quiet now that Rooster is officially on his own. My social media posts have included a lot of beach and pool photos with the hubby. We are empty nesters now and are learning how to live life in the slow lane. We treasure our weekends and downtime from work. Ha! What’s not collecting dust? I’m home on summer break, and while I should be catching up on cleaning and whatnot, I’m filling my hours with other activities. What I really need to do is go through my closet and prune rarely-worn / too-large clothes now that I’ve lost weight and am back in shape. I also need to get in my attic and decide what needs to go. Empty nesting has that effect on you…you want to purge. A song I always use in the end-of-the-year slideshows that I make for my classes is Good Riddance (Time of Your Life) by Green Day. I first used this song when Chicky was a senior, and I put together the slideshow for her school’s soccer teams’ banquet. This was her senior class song, and it spoke to me on so many levels. I still think of that special soccer season with her (the girl’s team went to the Final Four playoffs…unheard of for Podunk, USA). It seems that my life lately has constantly been about crossroads…paths diverging…saying goodbye to what has been known and hello to what is new. This song ALWAYS brings tears to my eyes. I typed this post late yesterday afternoon and finished right before I left for dinner. The hubby and I met some friends at a place on the beach. When we arrived, our friends were sitting at a table behind the guy playing a guitar and singing. A number of years ago, the kids and I were taking down plywood that I’d put up around my screened-in porch after a hurricane had passed by. When I lifted one piece, I discovered a very large, red snake that had somehow slithered between my brick and the wood. The snake and the brick were the same color, so I almost put my hands on it! There were kids playing in the yard of the house behind mine, and they stood on their trampoline and stared at me. Fortunately, the Mr. had come home on a break, and he was inside the house. He came out, grabbed a stick, and took the snake to the pond across from our house. If I knew it was completely safe, I might. I recently finished reading the Lunar Chronicles series that I bought for my classroom. A good portion of these books take place on the moon, so now I’m curious about what it’s really like up there. 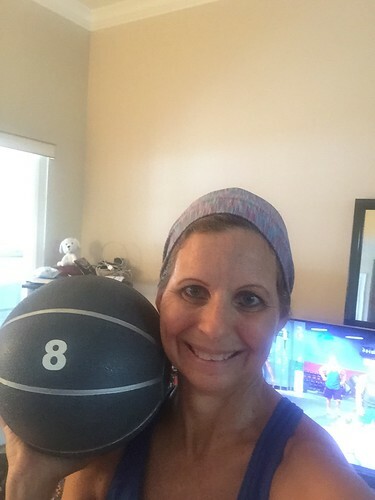 I’m working through my second round of Beachbody’s Hammer and Chisel (I don’t sell it, so please don’t think I’m trying to push this on you). I’m working extra hard and seeing some great results. What I like about doing this program again is that I can actually process some of the funny and motivational things Sagi and Autumn say during the workouts. First of all, who made the schedule? 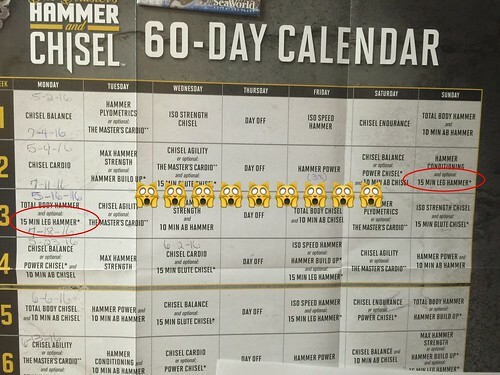 Look at what I circled below…two Leg Hammer workouts consecutively. Say what? These are after the other videos in the boxes. You use a medicine ball with the leg workout, and it is so dang hard! I’m only smiling because I’m done. 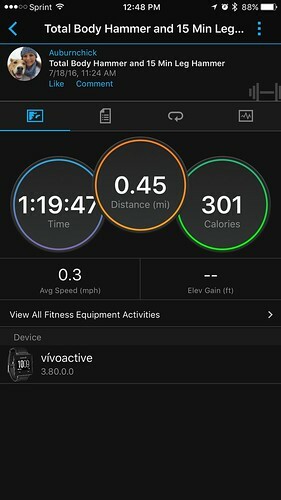 The payoff on Monday was worth it…BIG calorie burn! 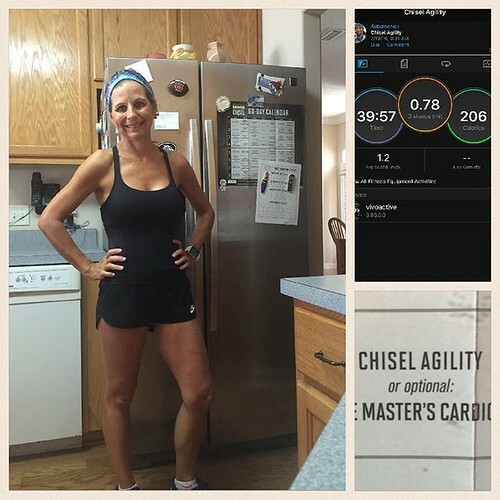 Then yesterday, I did Chisel Agility, which I really like (except for the jumping moves, which are freaking hard). I’m going to use this quote in my classroom. My students often get tired. That’s when they need to push through. The payoff will confidence and, although sometimes unseen, progress. I’m proof of that. It’s a great motto for life. I love that motto. I am going to put it in my planner so I can see it every day. Stopping by from Hodgepodge. Great job on the workouts. I just started doing the Combat 30 Day Challenge from DareBee.com. I am dying… lol. I shared the Chardonnay Go video on my Facebook page a few days ago. It’s a game I could get behind! I loved your song from Green Day as your “Time Song.” There is no way I am voting for the presumptive democrat nominee. I also know that if I stay home and don’t vote that is precisely what I’m doing. So I guess I’ll hold my nose when I vote. I hate that things have degenerated to this point. Thanks for stopping by by blog page. Isn’t that the dilemma though! I don’t want to vote against my conscience. Such a quandary!! !